Whenever a new movie comes out that isn’t a sequel, remake, or based on a comic book comes out, I have a bad habit of immediately assuming that it will be good. We can define it as confusing originality with brains. A good name for that would be Elysium Syndrome. With Chappie, Neill Blomkamp manages to pull himself out of a sophomore slump with something that is sometimes frustrating but often fun and filled with interesting, half-realized ideas. Chappie takes place during an undetermined point in the South African future, when the city of Johannesburg is riddled with crime. In response, a weapons manufacturer (boy, does Neill Blomkamp love weapons manufacturers) creates an army of robot cops to fight crime. Okay, so this is basically the exact same premise as RoboCop. However, the robots here are a lot clunkier and look like they are assembled from old auto parts. It is part of Blomkamp’s goal to create outdated futures that have something of a charm to them. A scientist named Deon (Dev Patel), who has more AI than people in his life, takes on a bold experiment to reprogram one of the robots to give it the capacity to learn. Thus, he gives birth to Chappie, who is played under a suit of scrap metal by the immensely talented Sharlto Copley. 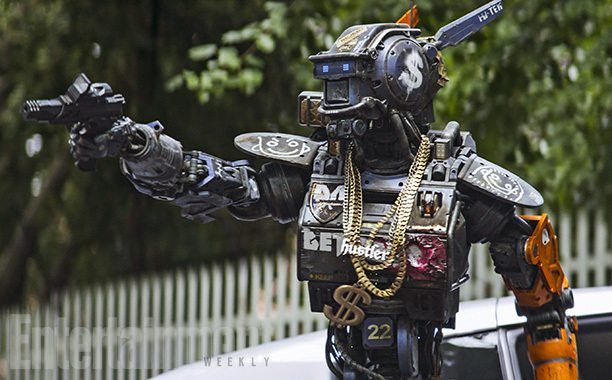 Chappie is taken in by a group of criminals who want to use him to pull off one last, daring heist. A movie about criminals trying to pull off one last, daring heist? I don’t think I’ve seen that before. The criminals in question are Ninja (Ninja) and Yolandi (Yo-Landi Visser), who are played by Ninja and Yolandi, who make up the South African rap group Die Antwoord. Now, I am not sure if they were playing Die Antwoord here or not, but given the fact that they have the same names and wear Die Antwoord t-shirts and listen to Die Antwoord songs, I have a feeling that there wasn’t a whole lot of acting there. I have never been able to tell whether Ninja and Yolandi are sincere or elaborate performance artists. That is probably what makes them so fun to argue about. What I will say, though, is that Yolandi is surprisingly sweet as Chappie’s motherly figure. Casting isn’t one of Chappie’s weaknesses; it is more what it does with its cast members. Hugh Jackman is surprisingly bland as a fellow inventor who has his own ideas about fighting crime. I guess the cargo shorts and mullet are good defining characteristics, but the film also has him throwing a rugby ball around for many of his scenes. This is either because he is Australian, or because he is playing a South African, or both. Chappie is the kind of film that has the chutzpah to cast one of sci-fi’s greatest heroines (Sigourney Weaver), and then sideline her in favor of more explosions. The real issue behind Chappie is not in the concept itself or in how it explores a larger moral issue (more on that soon), but how it sets up the world. District 9 showed that Blomkamp is actually quite deft at setting up fascinating exposition. Chappie introduces us to this world in fast forward, giving us only a vague sense of what it is like, and why things are going as badly as they are. This undercuts a lot of the social commentary that the film desperately wants to supply. This is coming from somebody who normally hates exposition. Yet, the lack of explaining also benefits the film in a lot of ways. Chappie introduces us to the idea that you can upload your consciousness on a flash drive. That is an insane idea. Somebody like Christopher Nolan might have spent a huge chunk of time trying to justify the neurological patterns that make this possible. Here, you are either on board, or you’re a square. There is something kind of liberating about that. Sometimes, sci-fi makes more sense when it isn’t constantly trying to justify its plausibility. I have said some bad things about Chappie, and it seems like most of the world hates it, but I couldn’t help but leave this film with a smile on my face. Sure, it isn’t until the third act that I actually felt any real sense of danger, but there is a fun, goofy feeling running through the film that just works. Plus, this film has a lot of ideas, and maybe a lot of them don’t make sense, but at least it actually presents them in a way where you can have a discussion about them. Chappie is a mess, but it is an entertaining one at least that gets halfway to saying something great. Maybe Chappie needed a better editor or a better writer. Either way, it proves this: Neill Blomkamp may not live up to the immense promise of District 9, but he’s no M. Night Shyamalan. If anything, at least this film gives us the image of an adorable robot wearing bling and throwing ninja stars. This entry was posted in Uncategorized and tagged Chappie, Dev Patel, Die Antwoord, Hugh Jackman, Movie Review, Neill Blompkamp, Sharlto Copley, Sigourney Weaver, South Africa on March 8, 2015 by ian0592.